All of these places were once filled with people living their lives and minding their own business. Abandoned for different reasons, now they look more like ghost towns or even the set of some horror movie. The mysterious remains of these formerly crowded and noisy locations can provoke fear, curiosity and excitement all at the same time. Knowing that only the most courageous risk-takers will dare to visit any of these places, we at LikeAble decided to take our very own virtual tour. Join us! The town was officially founded in 1876, when miners discovered rich deposits of gold and silver here. In search of wealth and a better life, people flooded into the small town. Soon the place earned the reputation of ‘sin city’, full of brothels and hopjoints. Subsequently, Bodie went bankrupt, and by the 1940s it became a real ghost town. Currently it is considered to be one of the best well-preserved ghost towns in the world. Eastern State Penitentiary in Philadelphia was operational from 1829 until 1971. Some of the most notorious criminals in America such as Al Capone were held here. After the prison was closed, it became a U.S. National Historic Landmark and a museum open for guided tours and art exhibitions. The railway system in the city of Czestochowa in southern Poland was built during the golden age of industrial development. Today, this abandoned railway station is one of the most mysterious places you can visit in Europe. In the early 1990s, Thailand experienced the largest economic boom of its history. During that time, the authorities and business circles demonstrated stability and financial success by initiating ambitious building projects, including the Sathorn skyscraper. However, when the Asian financial crisis shattered Thailand’s economy, the almost completed construction of the unique skyscraper was suspended. Currently, plans concerning Sathorn tower remain uncertain: experts have shown that to reconstruct the tower now will cost much more than to build a new one. Moreover, the tower has the reputation of a haunted building. Between 1885 and the late 1930s, the Riverside Hospital was one of the places operating in the USA for patients suffering from quarantinable diseases such as smallpox, typhoid fever, scarlet fever and leprosy. Until the hospital was closed in 1963, the island served as a drug rehabilitation center for heroin addicts. It is now an uninhabited bird sanctuary. The building of the hospital is still there, although it’s in danger of collapse, with its windows all broken and paint peeled off the walls. This relic of a bygone era stands at the top of the highest hill in former West Berlin. The place used to be a Nazi military college. After several unsuccessful attempts to demolish the building, the Allies decided to bury it under 120 meters of wreckage produced as a result of the massive Anglo-American bombing campaign during the Second World War. After the fall of the Berlin Wall, this abandoned building has had many owners. One of them, the famous director David Lynch, even planned to build a ‘Happiness College’ here to house yoga students. However, the authorities of Berlin turned down the proposals. During the French Revolution, the Count Liedekerke-Beaufort, a Belgian political activist, was forced to leave this castle with his family and move to a neighboring farm. After the Second World War and up to the late 1980s, the castle was taken over by the National Railway Company of Belgium and subsequently used as an orphanage and also a summer camp for children. In 1991, due to maintenance costs, the castle was abandoned. It seems like this Korean village was intentionally built to be empty and uninhabited. The village is located in the demilitarized zone between North and South Korea. After the ceasefire in 1953, the government of North Korea decided to use the small village as a propaganda tool: since it is the only town which can be seen from the territory of South Korea, it had to look perfect. Although the North Korean authorities have given assurances that ordinary citizens live in the village, close examination shows that the houses have no glass in their windows and are uninhabited. Lights in the village are all lit simultaneously at a certain time of day. Is this a fake town? This place was established by the American industrialist Henry Ford in 1927, when he started his corporate city project. It was intended to be a huge rubber plantation in the Amazon rainforest, along the east banks of the Tapajos river. Ford developed the idea of a corporate city with every facility imaginable — swimming pools, a golf course, bungalows, and even a place for practicing national American dances. However, the locals weren’t happy with the whole idea and refused to accept a ban on alcohol. Brazilian workers and American industrialists seemed to be in a permanent state of conflict over the issue, and in 1930, the native workers revolted in one of the town’s cafeterias. They threw the cars into the river and chased away the managers into the jungle. After that, the city was abandoned for good. Locals say that the cinema was built by a rich Frenchman who was once walking with his friends in the desert and decided that the only thing he needed there was a movie theater. He bought a generator in Cairo, a hundred seats, and a giant screen. Everything was ready for the first movie, but as it turned out the locals didn’t like the idea at all. They broke the generator, and the story ended before it even began. So now in the heart of the desert you can still find a white screen that never showed any movie. In the early 1970s, Varosha was a modern tourist area offering its luxury beaches to billionaires and celebrities. At that time, Cyprus was a famous tourist destination for Brigitte Bardot and Elizabeth Taylor, who took sun baths right on the Varosha beach. Everything changed in August 1974 when Turkey invaded Cyprus and occupied its northern part. 15,000 residents of Varosha fled in fear of a massacre, leaving behind their houses and other possessions. Most of them planned to come back soon, but the political situation remained tense, making it impossible to return to their homes. The then-luxurious Hotel del Salto, also known as Tequendama Falls Hotel, was built in 1924 in the city of San Antonio del Tequendama. Time passed, the Bogota river became more and more contaminated, and tourists gradually lost their interest in this area. 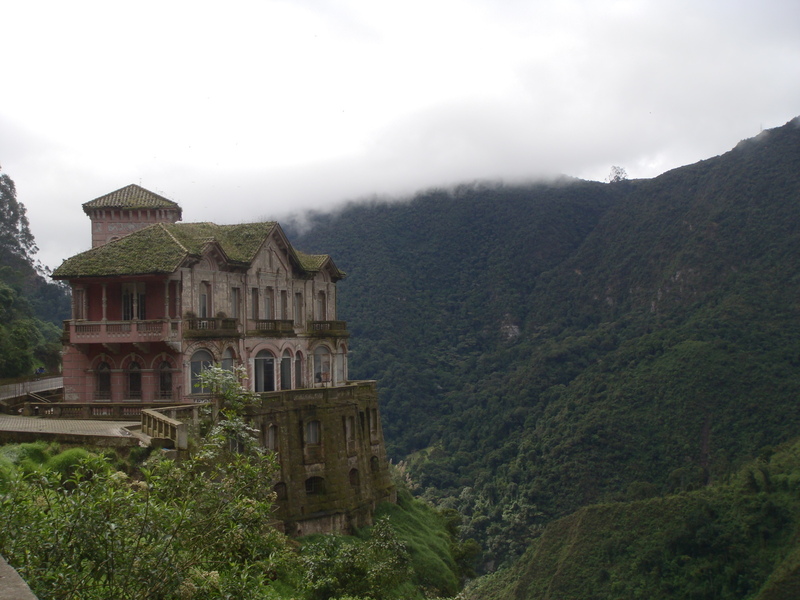 Many people have chosen this spectacular spot to commit suicide, so now the hotel is believed to be haunted. Discovery Island was a Disney amusement park in Florida. Once, some dangerous bacteria was found in the waters of Bay Lake, and the park was closed (in July, 1999). It has remained abandoned ever since. In 1958, John Greco built a religious theme park in Waterbury, Connecticut. The park was pretty popular back in the 1960s and 1970s, and the total number of visitors exceeded 40,000 people annually. In 1982 Greco decided to temporarily close the park for reconstruction and expansion, but died two years later. The park never opened again. The Orpheum Theater in New Bedford is an old abandoned theater in Massachusetts, USA. It was opened in 1912 and closed in 1959. The back of the theater currently houses a supermarket, but the rest of the space is still empty. Some non-profit companies are planning to revitalize New Bedford and bring the cultural attraction back. In the first few days whilst the vessel was still intact it was quite easy to gain access to the ship, and ladders were even welded to her sides by the Spanish Army. But since she broke in two it is definitely unadvisable to try and board the ship. Although she looks temptingly close, the currents in this area are extremely strong and sharp debris still lurks beneath the surface. Tragically at least eight people have died swimming to and exploring the wreck. How does a hamster store so much food in its cheeks?